An auto-referenced interferometric method for calibrating phase modulation of parallel-aligned liquid crystal (PAL) spatial light modulators (SLM) is described. The method is experimentally straightforward, robust, and requires solely of a collimated beam, with no need of additional optics. This method uses the SLM itself to create a tilted plane wave and a reference wave which mutually interfere. 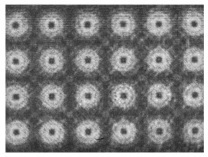 These waves are codified by means of a binary diffraction grating and a uniformly distributed gray level area (piston) into the SLM surface. Phase shift for each gray level addressed to the piston section can then be evaluated. Phase modulation on the SLM can also be retrieved with the proposed method over spatially resolved portions of the surface. Phase information obtained with this novel method is compared to other well established calibration procedures, requiring extra elements and more elaborated optical set-ups. The results show a good agreement with previous methods. The advantages of the new method include high mechanical stability, faster performance, and a significantly easier practical implementation.